This was the girls’ year, virtually across the board on nearly every Rio Hondo League team. Starting with the league’s biggest team, South Pasadena, which sent 25 girls to CIF, where only 9 Tiger men made the trip. The league’s second power team, Monrovia, was more balanced. They sent 12 girls and 11 men. But then you have San Marino sending 6 girls and just 1 guy. Bottom line - all girls at the State Meet. That is not to say that there weren’t big performances from the men. We’ll remember Paul Messana’s big season for a long time as well as Josh Wilson’s impressive 3200 performance at CIF Finals, where he led the race with 500 meters to go. But, it will be Laura Anuakpado’s huge post-season run to the State Finals, in which she posted faster performances at each level, that will mark the season. And the Tiger girls’ 4x400, populated by individual CIF athletes, fought all the way to the State Finals, just slipping into Clovis. And just to show that the league is not all Tigers all the time, the Wildcats’ Sidney Mosley made it all the way to State as a sophomore. To be sure, every season has it’s share of disappointments. While defending State high jump champion, Claire Keiffer-Wright, made it back to State, she had her difficulties starting with Masters. But, she has one more shot at it since she is only a junior. Perhaps the biggest disappointment was the injury to Monrovia’s Amanda Mansoorbakht. In what was setting up to be a classic 3-way fight between Mansoorbakht, San Marino’s Alissa Barraza and SoPas’ Anika Renken in the 800 at League Finals, Mansoorbakht had to drop out of the race due to a high thigh injury. Since she is a senior, we will not get to see her run again at this level. But, we will see Alissa Barraza, a junior, whose determined effort at CIF Finals almost netted her an invitation to Masters. Maybe in 2014. Unfortunately, we will not see the engaging Anika Renken, who has made her mark on this league. The same goes for Laura Anuakpado, who saved her best for last. We also say goodbye to Paul Messana, a class act all the way. But, we do get another year of Josh Wilson and are looking for him to make that jump to Masters. Temple City’s trio of pole vaulting girls will be back. Junior Vivian Yu was particularly impressive as she bested San Marino’s Anya Kwan (senior) at the Finals. Kwan set the school record in the event this year. Monrovia was absolutely dominant in the sprints for both genders. The few sprints they didn’t win (or sweep), they came awfully close. We say goodbye to the always cheerful and energetic Chasitty Fellows, our League Champion in the 100, runner-up in the 200 and a big part of both relay teams. On the men’s side, it was Cravon Gillespie everywhere - League Champ in the 100 and 200 and a member of the 4x100 team. Cravon is a junior so we will see him back next year. In the distance events, Tiger junior Helena Van Loan took the gold after besting La Canada’s Sonja Cwik. Cwik, who has been a fixture of the Rio Hondo League in both track and cross country, graduated this year and we will miss her. Fortunately, Temple City’s Austin Situ will be back. Austin is also a cross country fixture and as competitive as Josh Wilson is. We look forward to more great battles between those two next year. Finally, the Editor’s Choice. This is the one race or event that defined the spirit of the league in my opinion. It was the men’s 4x400 relay at the League Finals. An epic battle between Monrovia and South Pasadena. A race that the Tigers were out of until Justin Fernandez took that baton on the second leg and closed a huge deficit. From there, it was a neck-and-neck battle to the finish with Paul Messana ripping the final 100 meters to take it for the Tigers. As if that weren’t enough, Temple City and San Marino battled to the last inch for third. Want to watch it again? Click here. Goodbye to all our seniors. Thank you for being a part of our family. Paul Messana (right) shown with hurdler Hector Fernandez. Hector paced Paul for the first 400 meters. May 25 - Paul Messana is a determined man. 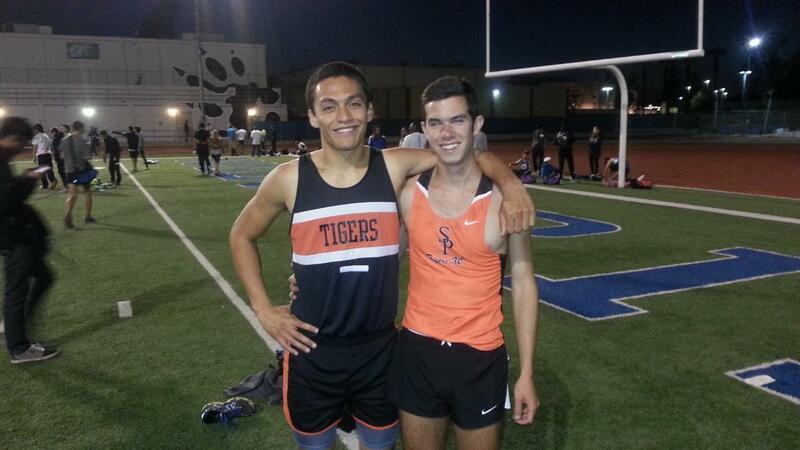 Having been a young teammate of one of the greatest distance runners to ever run for a Rio Hondo League school, Paul Messana set a season goal of breaking Sam Pon’s school record in the 800 (1:54.98). Could he reach any higher? I don’t think so. Having come up achingly short on so many occasions this season, Paul gave it one more whack on Saturday. He and hurdler teammate Hector Fernandez traveled out to San Bernardino and entered the 800 at the San Bernardino Valley College Distance Carnival. It was Hector’s job to set a fast pace through the first 400 for Paul. A job well done as Paul broke the tape in 1:54.84, a second better than his performance of the previous week which made him a CIF Champion. And now, a school record holder. Track and Field: South Pasadena High leaper finishes fourth at USA Outdoor Track and Field Championships in junior high jump with mark of 5 feet, 8 3/4 inches and earns berth to Pan Am Junior Championships in August. June 20, 2013| 10:55 p.m. 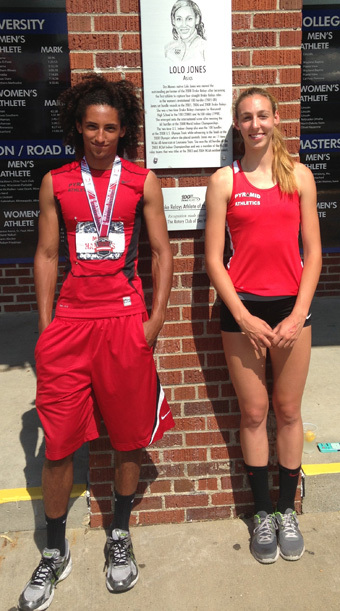 It took a 1, 667-mile, near cross-country trek, but South Pasadena High junior Claire Kieffer-Wright found herself a little redemption in Des Moines, IA.The Tigers’ multi-sport star leaped to a height of 5 feet, 8 3/4 inches in the junior high jumps at Thursday’s USA Outdoor Track and Field Championships at Drake Stadium on the campus of Drake University. Kieffer-Wright’s mark was the second-best and earned her a qualifying spot to the Pan Am Junior Championships in Medellin, Colombia, which begins Aug. 23. Overall, Kieffer-Wright tied with Erika Hurd, Alexa Harmon-Thomas, Dakota Dailey-Harris and Mimieux Land with the runner-up mark behind Rachel Proteau, the Oregon state champion who entered with a personal-best mark of 6-1 and who finished with a winning leap of 5-10 3/4. Kieffer-Wright earned fourth as she tallied more faults than second-place Herd and bronze-finisher Harmon-Thomas, but less errors than Dailey-Harris or Land. Kieffer-Wright’s bounce-back effort came after the reigning All-Area Girls’ Track and Field Athlete of the Year finished tied for 10th with a mark of 5-3 3/4 at the CIF State Track and Field Championships in Clovis on June 1. “I think the only real redemption from state will come at next year’s state meet, but today was a good rebound day to show what I’m really made of and how I can compete,” Kieffer-Wright said. For a while, it appeared Kieffer-Wright was in trouble. The one-time California state leader hit the bar twice at 5-7, the highest opening height Kieffer-Wright has ever attempted. Yet, on the third attempt, Kieffer-Wright cleared the pesky opening height and moved on to the next mark of 5-8 3/4. In a twist, Kieffer-Wright had no issues with her next hurdle as she easily cleared 5-8 3/4 on her first attempt and was only one of three entrants to do so. Unfortunately for Kieffer-Wright, the CIF Southern Section Division III champion was unable to carry over her momentum and no-heighted on her three attempts at 5-10 3/4. Kieffer-Wright initially punched her ticket to Des Moines when she leaped 5-10 3/4 on March 30 at Stanford and surpassed the qualifying mark of 5-8 3/4 (1.75 meters). She later eclipsed that mark in setting a new personal-best and then state-leading mark of 6 feet at the Mt. San Antonio College Relays on April 20. Pyramid Athletics took two additional competitors in Sherman Oaks Notre Dame’s Khalfani Muhammad and Orange Lutheran’s Myles Hawkins. Muhammad finished fifth in the 100-meter dash in 10.87 and Hawkins was sixth in the triple jump with a personal record leap of 49 feet, 10 inches.